Patients are being seen “more quickly” after US airmen and women started working at NHS hospitals in England in a bid to refresh “rusty” skills. The USAF nurses, from RAF Lakenheath in Suffolk, started working alongside staff at five hospitals this winter. Col Thomas W Stamp, commander of the 48th Medical Group, said it gave medics “a greater breadth and depth of cases”. Nick Jenkins, medical director at West Suffolk Hospital, said it “means we can treat more patients more quickly”. 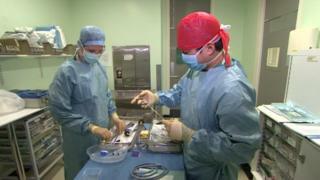 One USAF surgeon told the BBC she had carried out almost 200 operations. Five nurses and five technicians from the airbase are working at West Suffolk Hospital, in Bury St Edmunds; Norfolk and Norwich University Hospital; Addenbrooke’s Hospital, Cambridge; the Royal London Hospital and St Mary’s Hospital in London. Since 2012, about 20 American airforce surgeons have carried out placements at NHS hospitals, and in future whole teams of airbase surgical staff could conduct operations. Col Stamp said a “long term potential goal” would be treating NHS patients at RAF Lakenheath’s hospital, but security issues would need to be looked at before that could be considered. He said it was vital for US military medical staff to get experience of injuries that were not common at the airbase hospital. “We don’t see a lot of patients with serious injuries from being involved in a car crash or from gun wounds and stabbings,” he said. Having military nurses and medics working in our hospitals won’t save the NHS. But it is a good example of how partnership working can fill some gaps in the rota at a time when the health service is stretched and doesn’t have enough staff. It also gives medical staff at Lakenheath experience of dealing with emergency situations and complex operations, which they don’t get with a fit, young population. The possible idea to bring civilians on to the airbase to treat them with teams of military medics is an interesting one. It would utilise operating theatres lying empty and save money as Lakenheath staff don’t charge the NHS for their time. However patients would need to be moved on to the base quickly without security checks. Getting the NHS to agree would also be difficult, contracts would need to be drawn up in case of mistakes or litigation and it’s difficult to see how this would work without some money changing hands. US airbase surgeon, Dr Jamie Swartz, who has performed 71 procedures at Addenbrooke’s and 113 at West Suffolk, said she has gained a “fantastic opportunity to work on more complex cases”. Dr Jenkins said that while they help the surgeons and nurses gain experience at “the same time they use their skills for the benefit of our patients at the West Suffolk Hospital”.